Home About Us New To 3D Printing? Or want to learn more? No worries. That is why we are here. We’re a bit like a micro-brewery. At 3D Central you can come see our products being produced, sample a piece or two, sign up for a lesson or leave with everything you need to start your own printing. These FAQ’s will help get you started. What is 3D printing? How is it different from other forms of manufacturing? Many traditional methods of manufacturing are “subtractive” – a block of metal or piece of wood is cut or carved away to form a new shape. Or, as in the case of plastics, malleable material is injected into, extruded from, or formed around a metal mold to create solid parts. 3D printing is different, where parts are made by adding very thin layers of material one on top of each other, from bottom to top. While there are many different types of 3D printing –Fused Deposition Modelling (FDM); Stereolithography (SLA); Selective Laser Sintering (SLS) and many others, they are all essentially methods called “additive manufacturing”. Use computer aided design software (CAD) to create a design from scratch. Use a scanner to create an electronic version of a solid object. Download one from the internet. Save the design as a .STL file. 2. Slice the design into a tiny horizontal layers. The .STL file is processed by a piece of software called a ‘slicer’. The ‘slicer’ converts the model into a series of thin layers and produces a G-Code file containing instructions tailored for a specific type of 3D printer. 3. Print by extruding and/or fusing material one layer at a time from bottom to top. Select the layer thickness (or resolution) required and start printing. Production time will depend on the size of the part, and resolution level selected. The simple answer is, YES YOU CAN! If you are a designer, step 1 inside “How does it work?” will be easy. If not, we can help you get started or you can go to any number of libraries offering FREE designs, ready to print. For example, check out Thingiverse at www.thingiverse.com where you will find thousands of fun and useful designs to get you started. Unless you are downloading a “ready to print design”, Step 2 above may require a little help and/or training from us to ensure your design is “water-tight” without gaps or errors that may prevent a good print. After a short instruction from one of our team you’ll find Step 3 is pretty easy. And remember, with the purchase of any printer you will receive a FREE one hour tutorial. 3D printers today are very affordable. Our lowest priced printer costs less than $600, is easy to use and makes a great gift! And you can purchase over 2lbs of filament, enough for dozens of prints for less than $25. Check out our printers and accessories. What would I do with a 3D printer? The answer to that is obviously entirely up to you. But within reason, if you can think it, you can make it! 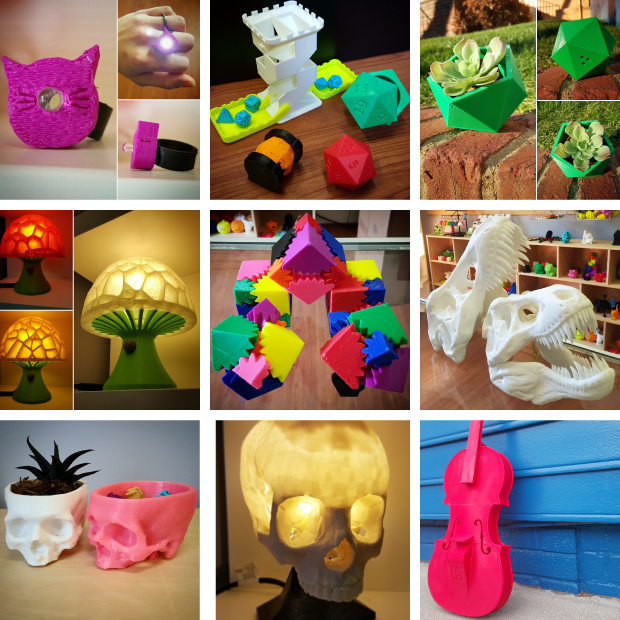 Click on “USES” to see how others have used 3D printing to support their businesses or hobbies; how educators are using them in schools to bring classrooms to life; and how artists are using 3D printing to further enhance their creativity. In short, the possibilities are truly limitless. I know a little about 3D printing, but how do I take this to the next level? Teach you the basics of 3D printing. Help you avoid common mistakes that may otherwise frustrate you, or if you are a teacher, your students when printing. Enhance your 3D design skills and learn best practices for achieving the highest quality prints. Help with a product idea and take it to design, proto-type or even production quantities. Answer technical questions or solve a repair issue. Help you decide which printer is best suited to you, your school or your business needs. Help you market an idea or take it to the next level. And just about anything else related to 3D printing. Check out our training and education services. I know a lot about 3D printing, but have a custom job in mind, what should I do? At 3D Central we specialize in custom design, and can help work with you to develop your project. We also offer one-on-one custom training in design or printing skills. Learn more.